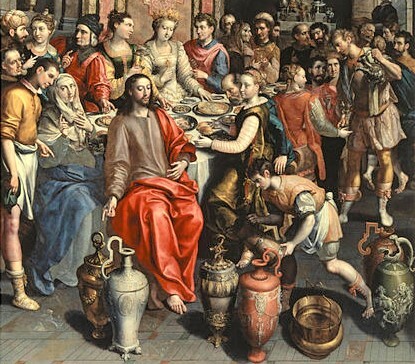 The first miracle of Jesus during the wedding at Cana was not to promote alcoholism but to manifest the glory of Jesus while helping the wedding host. Wine mixed with water was a necessity of the time to avoid sickness from the consumption of contaminated water. Mary, as a housewife, could understand the disgrace of the wedding host and she intervened rising to the occasion and not waiting for any appeal for help from the host. When Jesus helped the wedding host at the influence of his mother giving exception to his timing of salvific activity, Jesus also won the confidence of his disciples and the appreciation of the wedding guests who might have become the first communicators of his glory to the public. (1) On the third day there was a wedding in Cana in Galilee, and the mother of Jesus was there. (2) Jesus and his disciples were also invited to the wedding. (3) When the wine ran short, the mother of Jesus said to him, “They have no wine.” (4) [And] Jesus said to her, “Woman, how does your concern affect me? My hour has not yet come.” (5) His mother said to the servers, “Do whatever he tells you.” (6) Now there were six stone water jars there for Jewish ceremonial washings, each holding twenty to thirty gallons. (7) Jesus told them, “Fill the jars with water.” So they filled them to the brim. (8) Then he told them, “Draw some out now and take it to the headwaiter.” So they took it. (9) And when the headwaiter tasted the water that had become wine, without knowing where it came from (although the servers who had drawn the water knew), the headwaiter called the bridegroom (10) and said to him, “Everyone serves good wine first, and then when people have drunk freely, an inferior one; but you have kept the good wine until now.” (11) Jesus did this as the beginning of his signs in Cana in Galilee and so revealed his glory, and his disciples began to believe in him. (1) On the third day there was a wedding in Cana in Galilee, and the mother of Jesus was there. John the Evangelist starts his gospel with counting of days. On the first day, John the Baptist testified himself to the Levites and priests that he was the one crying out in the desert. (John 1:19-28). On the second day, John the Baptist testified Jesus as the Lamb of God who takes away the sins of the world. (John 1: 29-34). On the third day, John the Baptist directed his disciples Andrew and Simon Peter to follow Jesus. (John 1: 35 - 42). On the fourth day, Philip and Nathaniel met Jesus. (John 1: 43 – 51). Then the Evangelist starts the second chapter by stating “on the third day” after meeting Philip; that means the seventh day. Three days were needed for Jesus to travel from River Jordan to Galilee and to the village of Cana that was eight miles north of Nazareth where Jesus and Mary lived. The seventh day, according to Biblical numerology is a day of perfection and Jesus chose that day to manifest his glory through his first miracle. Third day can also mean Tuesday. According to the creation account in Genesis, every day after creation, God said “it was good.” However, it was only on the third and sixth days of creation that God said good twice. So, Tuesday was selected for the union of two good as one in marriage: the groom and the bride. Unlike present time, Jewish wedding was a one-week celebration when host was supposed to provide lodging, food and drink to the guests. The presence of Jesus in the wedding, along with his mother and disciples, was an indication of the value Jesus gave to marriage and family life. The love and unity of family is a representation of the Most Holy Trinity. Family life is sacred when the love of God is shared and experienced. John never mentions Mary by name in his gospel. May be in the Jewish culture, John was not using her name out of respect. She was there because she might be related to the host of the wedding. Cana and Nazareth were nearby small villages at that time and people knew one another. So, it was natural that almost all the villagers were relatives and friends and were invited for the wedding. (2) Jesus and his disciples were also invited to the wedding. Some interpreters say that it was the unexpected presence of the disciples of Jesus that caused the shortage of wine at the wedding feast. However, the gospel clearly states that the disciples were also invited. There is no reason to think that more than expected guests came because of the presence of Jesus. In fact, he became popular only after the miracle at this wedding. Wine was an integral part of Jewish meal. There was no purification of water at that time. Since plagues could happen because of contaminated water consumption, people were asked to drink water mixed with wine. To get drunk from wine was a disgrace. So, Mary and Jesus were not promoting alcohol consumption but compensating for the lack of popular healthy drink for the banquet. The wedding celebration lasted for a week. So, it was natural that they could get short of it within a week. Meal without drink was a disgrace to the host and so his family must have been alarmed on what to do. Only Mary knew that her son could do a miracle. That was why she approached her son for help. When Mary said this, she was expecting her son to perform a miracle because there was no other way to save the host at that difficult situation in a timely manner. Lack of food or drink during the wedding celebration was a serious offense against Jewish hospitality. There are cultural differences in saluting others. Jesus calling his mother “woman” was a normal, polite form of address and had a formal implication. The reference is to the book of Genesis where God declares enmity between “woman” and serpent. (Genesis 3:15). Jesus used the same term “woman” when entrusted Mary to the Apostle John while he was on the cross. (John 19:26). How does your concern affect me? The miracles of Jesus were not to help his family or his friends. They were to manifest his glory as the Son of God and to manifest himself as the Messiah so that people might attain salvation through him. (John 20:31). So, every miracle of Jesus must be related to his hour. His hour was his glory displayed in his passion, death, resurrection, and ascension (John 13:1). Jesus made use of the request of his mother for a miracle at the wedding of Cana as the appropriate time to start the manifestation of his glory. Another translation for “my hour has not yet come” as a question would be “Has not my hour now come?” This was not according to the time schedule of his Father. John 12:27 shows that the hour of Jesus was determined by his Father. However, he performed the miracle at the insistence of his mother. Mary might have thought that it was time for Jesus to manifest his glory. Mary’s direction to the servers was an indication that she had some responsibilities in the wedding arrangements. Mary was sure that her son would not decline her wishes even though he disagreed on the timing of the manifestation of his glory. Mary was more concerned with the difficulty of the family because she herself had faced poverty in the family. (6) Now there were six stone water jars there for Jewish ceremonial washings, each holding twenty to thirty gallons. Jews used to wash feet upon entry into the house because they were walking on muddy or dusty ground. Washing hands before and in between each course of the meal, and cleaning all the utensils carefully with water was necessary and a ceremonial custom. That was the reason why they had large water jars available with plenty of water. Six, according to Biblical numerology, is an imperfection because creation account was complete only with the seventh day made holy. Jesus perfected the water in the six jars through his first miracle. That means 120 to 180 gallons of wine was instantly made by the end of a single wedding. Thus, a highly excessive quantity of wine was made available. This abundance of wine recalls prophecies of abundance in the last days. (Amos 9:13–14; Hosea 14:7; Jeremiah 31:12). (7) Jesus told them, “Fill the jars with water.” So they filled them to the brim. Jesus told the servants to fill the jars with water so that they become witnesses of what happened there. (8) Then he told them, “Draw some out now and take it to the headwaiter.” So they took it. Headwaiter can be a friend or family member in charge of food distribution. Jesus wanted him to witness to the quality of the wine. (9) And when the headwaiter tasted the water that had become wine, without knowing where it came from (although the servers who had drawn the water knew), the headwaiter called the bridegroom. Jesus did not make the miracle a public event. Instead, he did that in private to save the reputation of the host. That was why only the servants knew where the wine came from and they publicized the miracle. This assured that the wine Jesus made through his miracle was the best wine. (11) Jesus did this as the beginning of his signs in Cana in Galilee and so revealed his glory, and his disciples began to believe in him. Though John acknowledges that Jesus performed many signs or miracles (John 20:30), he describes only seven which is a perfect number according to the Biblical numerology. Besides helping the family from their disgrace, according to John the Evangelist, it was also an occasion for Jesus to manifest his glory. The manifestation of Jesus’ glory according to John the Evangelist was “that you may come to believe that Jesus is the Messiah, the Son of God, and that through this belief you may have life in his name.” (John 20:31). This first miracle happened before the selection of some disciples as apostles. The faith of the disciples in Jesus had increased because of this miracle. 1. When Jesus helped the hosts of the wedding in their misery, Jesus himself gained by the increase of faith of his disciples in him. People also acknowledged the glory of God. When we help others, we also gain blessings from God and from the people. 3. Mary, whom Jesus entrusted to John as his and our mother is always watching over our difficulties as she did at the wedding at Cana. She does not perform any miracle. She intercedes for us when we are in distress. Her message to us is what she said to the servants in at the wedding of Cana, “Do whatever he tells you.” So, let us follow the teachings of Jesus, and then he will take care of the rest. 4. The six stone jars and water stood for imperfect or unfinished laws of the Old Testament. Jesus came to perfect the old with the new covenant of grace. So, Jesus made use of the old and converted it to a higher level. Jesus can change our present imperfection and dissatisfaction to the perfection and joy of heaven by our undertaking of what he tells us to do.